The present research focuses on optimizing the process parameters of die-sinking electric discharge machining on tool steel. 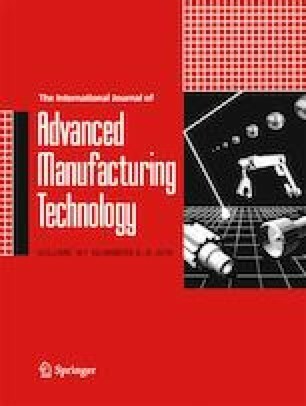 The basic objective of this research is to investigate the influence of two categorical factors including dielectric type and electrode polarity, and two numeric factors including discharge current, and Spark/Discharge Gap on material removal rate (MRR) and surface roughness (Ra) for machining of AISI D2 steel. Box-Bhenken design based on response surface methodology (RSM) was applied for experimental design. For estimation and evaluation, the effects of the process parameters on response variables, RSM has been integrated with grey relational analysis (GRA). Ranking of factors has been done with respect to the grey relational grade. (ANOVA) was further performed for determining the significance of grey relational grade. ANOVA results reveal that that polarity having 50% of percentage contribution was the most significant factor affecting the performance measures followed by the spark gap, discharge current, and dielectric type. The grey relational grades were further optimized through desirability function and the optimal condition for input parameters was obtained. The optimum levels were discharge current at 15 A, dielectric type of kerosene oil, spark gap at 6 mm, and polarity of positive has been determined. The confirmatory tests were run for verifying and validating the results and improvement in productivity (MRR) up to 17.23 mm3/min and quality (Ra) up to 3.86 μm at an optimum have been observed. This work is jointly supported by department of industrial engineering, university of Engineering and Technology Taxila Pakistan and HEC project # 731, Department of Physics, Khushal Khan Khattak University, Karak Pakistan.